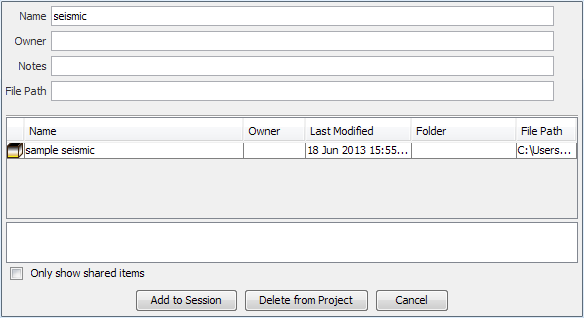 Volumes already in the project database can be loaded into the session using the Add icon in the Volume tab. Click the Add icon at the top right and select Load volumes already in the project. The Add volumes to Session window will be displayed. 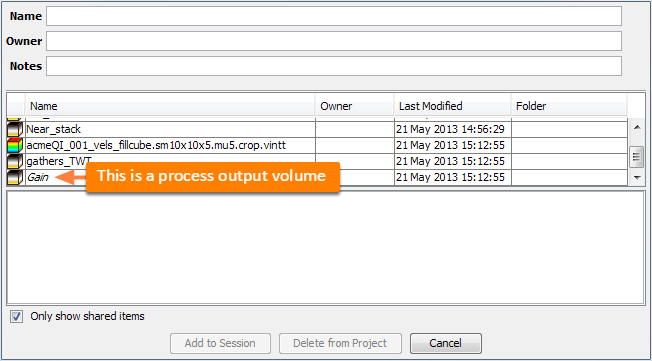 To filter the volumes, enter the Name, Owner, Notes or File Path of the volume. To only show items that are owned by you, or items marked as shared, select the Only show shared items check box at the bottom left of the window (see Multi-user Considerations). Note: The special character '%' can be used to simplify your search and filter the results (see Filtering search items). Select a volume or multiple volumes that you want to add to the session. The Add to Session button will be enabled. Click this to add the selected volume(s) to the current session. When searching for volumes, those that are generated from processes appear in italics in the search window. Selecting a process volume will import the process that created it. By contrast, on-disk volumes are displayed in normal font.